Fumi : is a well established manufacturing and design company. Our mission is to provide solutions to everyday problems with Fashionable, Unique, Multipurpose and Innovative Products. We strive to make the lives of our customers easier by combining Fashion and Function. Established in 2007, the FUMI, Inc. has grown into a global brand and is continuing to grow! I received the pink/Peach Fumi to try and review. I was excited when I found out I was getting the opportunity to try FUMI. I have always wanted something like this for the simple fact that I'm a purse junkie!..Being a purse junkie comes with the fact that I have different colors and patterns of purses.. and the worse of them is the dreaded..White purses! Eeek! My husband bought me a cute little brown and white purse I loved that he got it for me but the white made me cringe. But I love it and I thanked him for it and it's the main one I use now. But what comes with my purse being white is dirt..dirt..and more dirt..oh and every other thing that appears on white! Ugh! my husband and I love to go out to dinner on payday and lets face it..restaurant floors are not the cleanest part of places like that. Ick! trust me..working in as many restaurants as I have worked in the floors do NOT get the attention that they need! That's where my Fumi came in..I was able to to keep my mind off of my cute purse that my husband so sweetly bought me away from the nasty germmy floors, shopping carts and other nasty areas that my purse encounters! Not only does FUMI my purse germ and nasty free it's a double treat! you can use FUMI as a bangle/bracelet, but you can put it on your purse strap for a purse accessory and or the convenience of the possible purse hook. I love my FUMI! 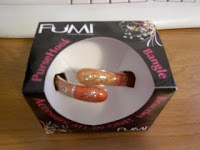 ♥ Fumi would make a great present for that special woman in your life. And with mothers day comming up she would love a FUMI! ♥ I receive no monetary compensation for this review. I was provided a FUMI to try and give my honest opinion.